Ing "Detroit" lilipat ya keni. 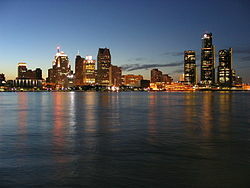 Para keng aliwang gamit, lawen ye ing Detroit (disambiguation). Palayo: Motor City, Motown, Rock City, Hockeytown, The D.
↑ USGS detail on Detroit. Retrieved on 2007-02-18. Burton, Clarence M (1896). Cadillac's Village: A History of the Settlement, 1701-1710. Detroit Society for Genealogical Research. ISBN 0-943112-21-4. Burton, Clarence M (1912). Early Detroit: A sketch of some of the interesting affairs of the olden time. Burton Abstracts. Template:OCLC. Chafets, Zev (1990). Devil's Night: And Other True Tales of Detroit. Random House Publishing Group. ISBN 0-394-58525-9. Farley, Reynolds, et al. (2002). Detroit Divided. Russell Sage Foundation Publications. ISBN 0-87154-281-1. Gavrilovich, Peter and Bill McGraw (2000). The Detroit Almanac. Detroit Free Press. ISBN 0-937247-34-0. Sugrue, Thomas J (1998). The Origins of the Urban Crisis. Princeton University Press. ISBN 0-691-05888-1. Tauli yang miyalilan ining bulung anyang 00:12, 5 Pebreru 2018.